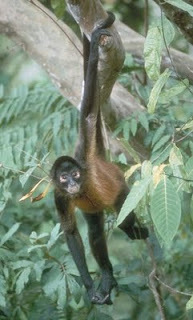 A Geoffroy’s Spider Monkey hanging on the branch. Photo from Primate Info Net. Wild Geoffroy’s Spider Monkeys (Ateles geoffroyi) or Black-handed Spider Monkeys had been documented using tools to scratch themselves, according to a new publication “Tool use in wild spider monkeys (Ateles geoffroyi)“. Important to note that spider monkeys do not have thumbs, only four fingers (picture below) so tool manipulation is rather limited but nonetheless a rather interesting find. 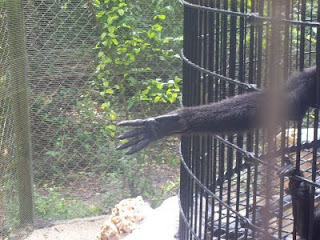 The hand of a Geoffroy’s Spider Monkey. Note that they do not have a thumb and only four fingers. Photo from Wikipedia. The first to scratch was an adult female. Holding a small, leafy branch in her hand, she scratched her chest and abdominal regions.The second, another adult female, used a detached stick lacking side branches and leaves to scratch her left side. She chewed the tool tip between bouts.